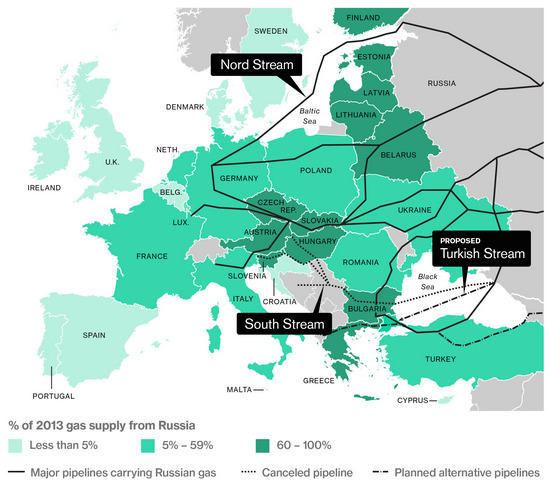 Ukraine is Russia’s gateway into European gas markets. Of the 193 billion cubic meters (bcm) Russia’s state-owned Gazprom pumped westward in 2017 – nearly 40 percent of Europe’s total supply – 93 bcm transited via Ukraine. Moscow, however, wants to change that, diminishing Ukraine’s transit role. Kyiv, on the other hand, hopes to maintain the current arrangement, as transit revenues contribute some USD 2-3 billion annually to the Ukrainian economy (roughly 3 percent of GDP) and act as a buffer against further Russian aggression. The poor state of Ukraine’s energy sector, which is beset by aging infrastructure, overregulation, uncompetitive pricing, and limited diversity of supply, means that Ukraine is economically and strategically reliant on the Russian gas transit, and is buying Russian-sourced gas and coal despite the state of belligerency between Kyiv and Moscow. This gas dependence cuts both ways, however. The vast network of pipelines crisscrossing Ukraine (see map) affords Kyiv some geopolitical leverage in its ongoing conflict with Russia, as Moscow needs the uninterrupted revenue stream provided by gas sales to Europe. But Ukraine’s leverage is shrinking fast, with the Gazprom -- Naftogaz transit arrangement set to expire January 1, 2020. The expansion project of the existing Nord Stream pipeline, known as Nord Stream II – is Russia’s attempt to diminish its reliance on the Ukrainian corridor for gas exports. 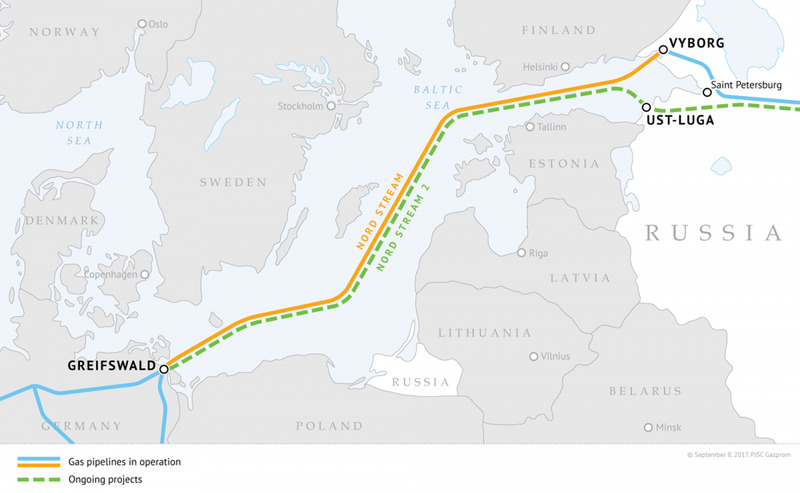 The new route will allow Gazprom to increase its direct supply to gas-hungry Germany via the Baltic Sea, spanning 1,230 km form from Ust-Luga, Russia to Griefswald, Germany. Nord Stream II would run alongside the original Nord Stream pipeline and deliver an additional 55 billion cubic meters of gas, effectively doubling the project's capacity. The completion of this pipeline, and the launch of Turkstream, would strengthen the Kremlin’s stranglehold over Europe’s energy security and jeopardize the economic and physical security of Central and Eastern Europe – Ukraine most of all. Despite protests from the United States and a number of European countries, the political and economic momentum behind Nord Stream II may be too great to overcome. European leaders and private beneficiaries are galvanized by the project, insisting on seeing Nord Stream II as a purely economic endeavor, which would strengthen the EU’s energy position. These proponents wrongly assert that more cheap gas equals more security. But when that gas comes from Russia, which has time and again used its energy supplies as lever of power over its neighbors, it cannot be considered reliable. In fact, it is a liability. Sweden, Finland, and Germany have already granted the construction permits for Nord Stream II through their exclusive economic zones (EEZ), with Denmark as the lone holdout. Copenhagen may come around shortly. The last hope for Ukraine to maintain its relevance as a gas transit may be German Chancellor Angela Merkel, who finds herself in the midst of a constitutional crisis over immigration. Merkel, once a vocal advocate of Nord Stream and the lower gas prices it would bring to Germany’s export-based economy, has since walked back her support. Key members of her coalition, including her one Christian Democratic Union (CDU) party have expressed concern over the project on environmental and security grounds. Others, like the Christian Socialist Union (CSU) and even some in the Social Democratic Party (SPD) are unequivocally opposed to the creation of a special relationship with Russia. Merkel has thus pivoted on Nord Stream, telling President Putin in an April phone call that the project cannot continue without transit guarantees for Ukraine. At the same time Ukraine’s own domestic energy sector is facing a number of headwinds. Currency devaluation, corruption, overregulation, uncompetitive tariffs on oil and gas exploration, lack of a qualified workforce, and a significant drop in natural gas prices are major obstacles which Kyiv must overcome. Furthermore, a weak and unstable banking sector limits the availability of credit to finance imports or new domestic projects needed for modernization. To its credit, Kiev has embarked on an unprecedented process of liberalization. From a market once wholly reliant on direct supplies from Russia, Ukraine's gas market today hosts dozens of gas traders operating in Ukraine, importing gas from several EU Member States. In addition, Ukraine's gas consumption has decreased dramatically, while domestic gas production has increased to highest levels in two decades. However, fundamental reforms, such as unbundling of the state oil and gas company Naftogaz, are continuously postponed by the Ukrainian presidency and the Cabinet. Advances in the renewables and nuclear energy sector are another silver lining for Ukraine. While over 50 percent of Ukraine’s energy is supplied through nuclear power – second in the world only to France, the Ukrainian government is making strides in the buildout of its solar and wind capacity. As the result of a 2017 law, Ukraine now boasts some of the most attractive feed in tariffs (FITs) on the continent for its renewables energy, offering to pay providers much more than the European average. Yet, Ukraine has a long way to go to build up its renewables. For now, the fate of Nord Stream II remains unclear. But political and economic indicators suggest that the project will soon be a reality. If Nord Stream II is completed, it will be a severe blow to transatlantic relations, and EU energy security. The Kremlin has proven time and again that gas is not a commodity but a weapon to wield over its neighbors. There is simply no way that more market power in the hands of state-controlled Gazprom equates to a more secure Europe. To diversify sources of electricity, Ukraine needs to build up the renewables sector, diversify and regularize suppliers of coal, and keep the nuclear energy infrastructure safe and up-to-date. Finally, to protect itself, Ukraine needs to step up efforts to create a transparent and competitive gas market less reliant on Russia. It needs a gas market that will contribute to EU energy security rather than place it in jeopardy.